On the first day of Christmas, Bah Humbug gave to me... a tree that lost its lights. On the second day of Christmas, Bah Humbug gave to me... we weren't allowed to wear jeans... and a tree that lost its liights. On the third day of Christmas, Bah Humbug gave to me... a broken brake line, we weren't allowed to wear jeans... and a tree that lost its liiights. On the fourth day of Christmas, Bah Humbug gave to me... two burns on my wrist, a broken brake line, we weren't allowed to wear jeans... and a tree that lost its liiiights. On the fifth day of Christmas, Bah Humbug gave to me... a step-son who moved away, two burns on my wrist, a broken brake line, we weren't allowed to wear jeans... and a tree that lost its liiiiights. On the sixth day of Christmas, Bah Humbug gave to me... cows that keep getting out, a step-son who moved away, two burns on my wrist, a broken brake line, we weren't allowed to wear jeans... and a tree that lost its liiiiiights. On the seventh day of Christmas, Bah Humbug gave to me...a husband with a fever, cows that keep getting out, a step-son who moved away, two burns on my wrist, a broken brake line, we weren't allowed to wear jeans... and a tree that lost its liiiiiiights. On the eighth day of Christmas, Bah Humbug gave to me... husband flipped his 3-wheeler, husband has a fever, cows that keep getting out, a step-son who moved away, two burns on my wrist, a broken brake line, we weren't allowed to wear jeans... and a tree that lost its liiiiiiiights. On the ninth day of Christmas, Bah Humbug gave to me... husband's separated shoulder, husband flipped his 3-wheeler, husband has a fever, cows that keep getting out, a step-son who moved away, two burns on my wrist, a broken brake line, we weren't allowed to wear jeans... and a tree that lost its liiiiiiiiights. On the tenth day of Christmas, Bah Humbug gave to me... husband won't get an x-ray, husband's separated shoulder, husband flipped his 3-wheeler, husband has a fever, cows that keep getting out, a step-son who moved away, two burns on my wrist, a broken brake line, we weren't allowed to wear jeans... and a tree that lost its liiiiiiiiiights. On the eleventh day of Christmas, Bah Humbug gave to me... now I'm not sleeping, husband won't get an x-ray, husband's separated shoulder, husband flipped his 3-wheeler, husband has a fever, cows that keep getting out, a step-son who moved away, two burns on my wrist, a broken brake line, we weren't allowed to wear jeans... and a tree that lost its liiiiiiiiiiights. On the twelfth day of Christmas, Bah Humbug gave to me.. my family is far away, now I'm not sleeping, husband won't get an x-ray, husband's separated shoulder, husband flipped his 3-heeler, husband has a fever, cows that keep getting out, a step-son who moved away, two burns on my wrist, a broken brake line, we weren't allowed to wear jeans... and a tree that lost its liiiiiiiiiiiights. I think you better come to my house for hot chocolate with whipped cream and chocolate shavings on top. At least you have those lovely dogs. Wishing you, if not a merry Christmas, at least a happy new year (it has more days in it, so some of them might at least be an improvement). Love the whale eyes on the pup on the right side of that picture. I can tell they were ALL really thrilled to be wearing those hats! yeah right! That revised song is a hoot! Merry Christmas to you and yours! that darn hubby should have stayed home with his fever & maybe he wouldn't have had those other misfortunes! 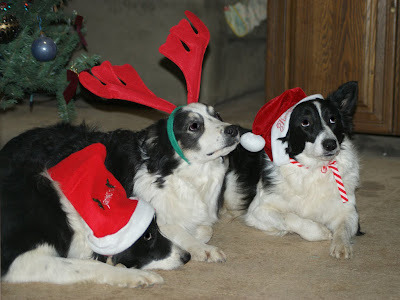 your pooches are pretty & looking good in their hats! Funny thing about luck and how it runs in waves.... This reminds me of the Christmas when a water pipe burst while I was at work and flooded the house - including the presents - and then we all had a turn with the puking virus. Fun times. Love your blog! I'll definitely be back!